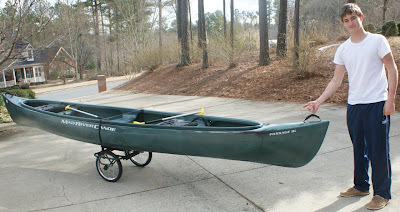 Recently I purchased a Mad River Passage 16 Canoe for my son's birthday. You can see the canoe review by going to this link or clicking on the label in the right column. We have lake access in our neighborhood, but our house doesn't back up to the lake, so we have an issue with getting the canoe to the lake. 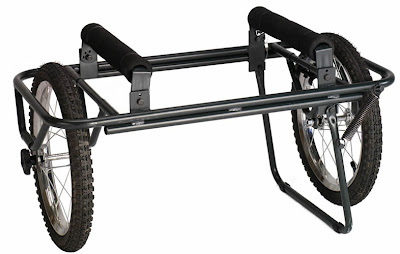 That's why we purchased the Pacific Outdoors Foldable Canoe Carrier. We ended up getting it from Amazon.com for $83.95 and we got free shipping. You may need to search on "Canoe Carrier" to find it. Before I continue with the review, I want to give you a better understanding of how we are going to use the carrier. The photo below shows our path to the lake. 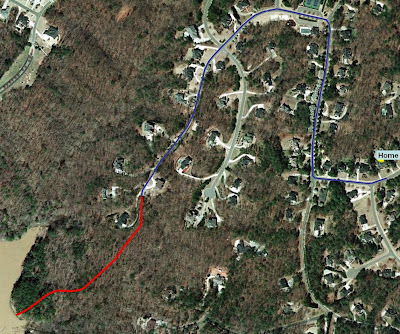 It is 0.73 miles of paved road (shown in blue) and 0.26 miles (460 yards) down the trail to the lake (shown in red). That is a total of about 1 mile, one way. Since we were going to have so much road travel, I wanted to make sure whatever I got would handle the road well. That's why I went with bicycle type tires. The path down to the lake is a hard trail, so again, bicycle tires should work well. What's in the box? 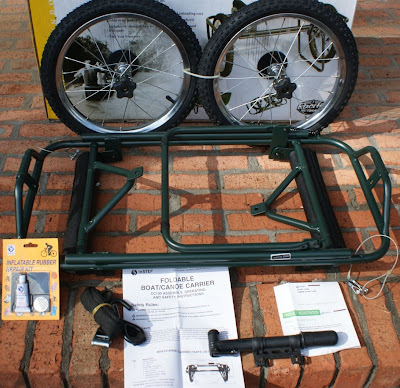 The basic frame, two tires, one strap, tire pump, patch kit, instructions, and a product registration card. 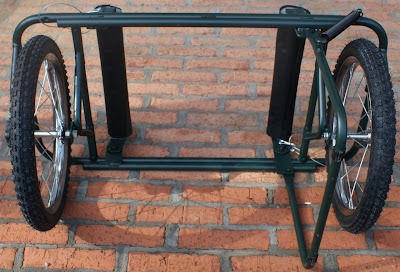 Since the basic frame comes preassembled so there is very little assembly required. 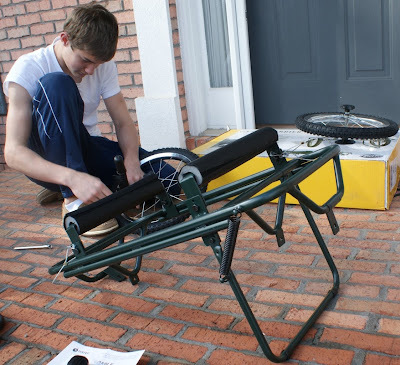 All you need to do is pump up the tires and mount the tire on the inside pivoting arm. 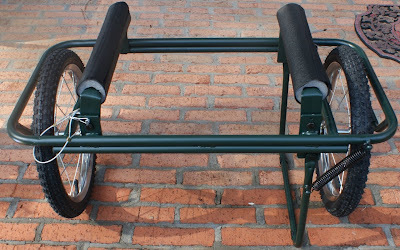 The rest is just a matter of adjusting the position of the padded cradle rest and unfolding the tire when ready to mount the canoe. These next couple of photos show the carrier from different perspectives so you can see a little more detail. 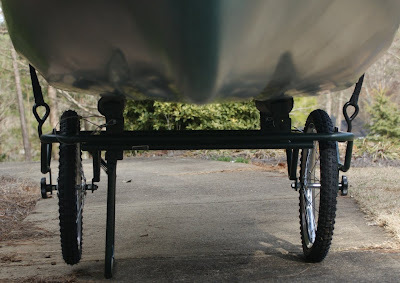 You can see below how to adjust the padded cradle rests to three different positions based on the bottom of your canoe or boat. When you pull the pin, the rest will can pivot in to two more positions. I thought this was a little odd that you pivot in instead of out. 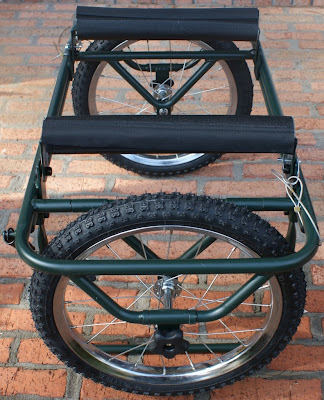 Pivoting out would give you more support to prevent the wheels from getting out of alignment. Later I may try swapping the rests from one side to the other and trying pivoting them out. For my canoe, the most vertical position seems to work best. If I rotate it in, and the the rest gets in the groove on the bottom of my canoe, the tire will touch the bottom of the canoe. At vertical, it is no problem. The next couple of photos show the carrier in the folded position. With the kick stand down, it was not very hard to get the canoe balanced on top of the carrier. 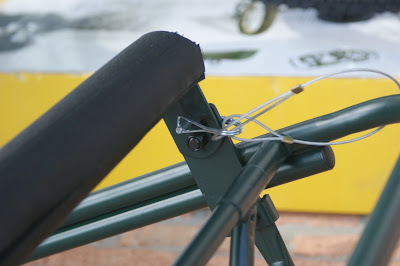 Notice that the tie down strap is not in place. 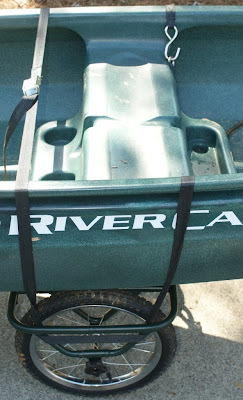 Next we strapped the canoe to the carrier. The engineer in me was saying that this single strap would not be enough for any bumpy trails and later I was proven correct. 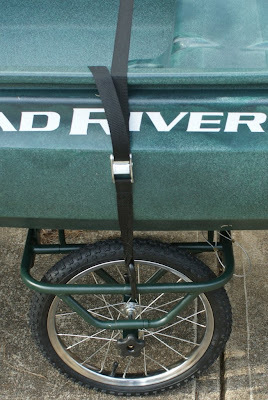 With the canoe balanced and on pavement, this carrier works like a champ. You can see my son moving it around with one finger. You can steer the canoe with so much ease that even a small child could move it around. At this point, we called it a day due to winds and decided we would wait until the next day to do our real test run. Unfortunately I don't have any photos on our first test run. It wasn't that I didn't take the camera, it was that I (the dufus) didn't take the memory card. I had some great photos, they just never got stored. Anyway, I decided that instead of starting out with a single strap that I would go ahead and put a double strap over the canoe. I really didn't think one in the middle was enough, so I put one on each end of the carrier. We cranked the 4-wheeler up and had my wife drop us off at the trail. I held the end of the canoe while we pulled it the 3/4 miles to the trail. It worked fabulous. Next my son and I started down the trail. There were some areas with ruts and we had to go around trees, but it worked fairly well. 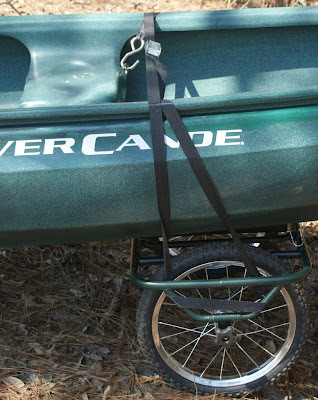 We had to stop once to tighten the straps more, but it definitely needed double straps because you could tell the wheels would try to get out of alignment with the canoe. Still no big deal and we were happy. About half way down, I decided to guide it by myself. I was on the front and as we kept going, it felt like that end was getting heavier and heavier. Sure enough, the wheels were working themselves farther back on the canoe. That's when we regrouped and decided to run one of the straps under the seat. This configuration worked great and that's what we did for the way back home. On our next test run the following weekend, I got a longer strap out of the basement and decided to do the double strap method and loop under the seat like last time. Pay close attention to how the strap loops around the carrier. This way it helps keep the straps separated. At the end of the second trip to the lake, the carrier had shifted as shown below. Honestly, this was not a big deal because the added weight I was feeling was still a lot less than carrying half of the canoe. On our trip back out, I looped both the front and rear sides of the strap under the seat and it slid very little all the way home. 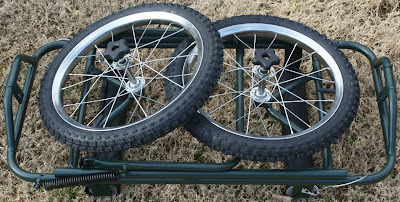 The Pacific Outdoors Foldable Canoe Carrier definitely rolls good and make canoe transport much easier. I wish they would have either put two straps in the package or made the single strap longer so that you can strap it down in the front and back of the carrier. Straps are cheap and if you have a canoe, most likely you have an extra strap somewhere. I think the big challenge is strapping the carrier to the canoe in a way to prevent the carrier from slipping down the canoe. Granted, I feel like my trail may have been a little more rugged than the average, so maybe this isn't a problem for where you may need to take your boat. Overall, we are pleased and I believe that strapping the boat down is the critical step for any carrier and you need to study your boat and carrier to determine the best way. I would definitely recommend this product.